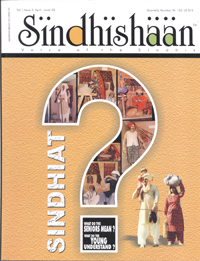 I feel great joy to have received SINDHISHAAN (vol. 1 issue 1 & 2). I am immensely impressed by the overall appearance (the getup and the production) of the publication and also the selection of the valuable and good quality material, appropriately and artistically illustrated and designed. It is pleasing both to the eye and the intellect. It is really creditable that you have been able to muster and collect articles of high standard, prepared with a lot of research and pains-taking efforts, by your colleagues. Twin objects spelt out by you of promoting the Sindhi language and rich Sindhi culture and building solidarity among the community are laudable and will endear you to Sindhis all over the world. Please accept my sincere appreciation and congratulations for your noble mission. I assure you of my co-operation. If I can be of any help in the noble cause please do not hesitate.